When I was a little girl in elementary school, and started learning about foreign countries with other languages, I always wondered, why was I born a little white girl to middle class Christian parents in America, instead of being a black girl living in poverty in primitive Africa, or a French girl living in a palace in Paris. I wondered: why did God pick me to be born to my parents, in my circumstances. As a teenager, I was very involved with my church youth group, and during the summer helped with vacation Bible School. That was where I had my first encounter working with underprivileged children. 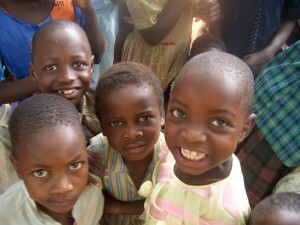 I sensed their hunger for love and caring and felt satisfaction with being able to provide it, however if only briefly. It felt good to feel needed, and felt good to be able to meet a need. That feeling led me to pursue nursing as a career. I wanted to be in a service profession, to help others. And I have been fortunate to have a wonderful career as a nurse and nurse practitioner. As an adult in my forties, I started going on short-term medical mission trips with my church. My eyes were opened to how much we Americans have, in relation to the developing world. I would return home, and want to go back, to be somewhere for more than a week, to find a way to stay longer and do something more significant, more lasting. I would come home and peruse the Peace Corps website. But my children were still in school and there was no way, not then. I never told a soul how I felt. I’ve come to recognize I’ve had this yearning for a long time, this desire to go somewhere that doesn’t have what we have here in the states, to serve others in a meaningful way, to take the blessings of my resources, my education, my expertise, and give it to someplace that really needs it. God put that yearning in me. At least for a minute or two. Then I responded, “Don’t toy with me. I’ve always wanted to do something like that.” I told him, if he really meant it, he had to show me, he had to find out more about it, how to make it happen. I didn’t want to get all excited about it, invest time and energy, only to have him later tell me, he wasn’t really serious after all. Well, if you know my husband, when he decides to do something, he jumps in with both feet, full force. Within days, we were attending our first Peace Corps recruitment meeting. We started the application process, and he gave me deadlines for completing my essays, contacting my references, and finally hitting the send button to submit the online application. He became a man obsessed with joining the Peace Corps. God put that desire in him. The rest is history. An amazing set of coincidences, or “good luck”? I don’t think so. We sold our house in July of 2010, the worst month for real estate sales in decades. After being told we would not be going to Eastern Europe, the location we were originally nominated for, we were a little anxious. There was not a conveniently located facility for my annual mammogram, so our placement would be changed to a country that could accommodate that need. Where would we be sent? We joked about maybe getting one of those Caribbean Islands, like St. Kitts. We waited patiently for an assignment. A few weeks later we visited the CDC museum, to view a photo exhibit of health care workers around the world. After lingering over the photos, many of which were from Africa, deep in thought about what it would be like to serve in the Peace Corps, I said to Marion, “I always pictured myself in Africa”. That very afternoon, not three hours later, we got the phone call from the Peace Corps placement officer. “Are you willing to go to sub-Saharan Africa?” she asked. Yes, YES, definitely YES! We moved in with my 87 year old mom in east Cobb after selling our house. It has been a blessing for us, and a blessing for her. We decided to find a new church close to her home, and started attending Johnson Ferry Baptist Church. We sought out a Sunday school class of folks similar to us in age, empty nesters, starting a new phase of life, and were fortunate to join the Seasons class. As we told the group we were joining the Peace Corps and going to Botswana, a gentleman invited us to meet his friend, Jeff Williams, who is partnering with others in Botswana; to help with Christian based community education for teenagers, for HIV prevention. We met Jeff and were blown away by his passion for the people of Botswana and this mission to help with HIV prevention. Jeff is an amazing man, with connections with all sorts of government officials in Botswana, and ties to a strong Christian church in Gaborone. The list of “God things” continues to grow. Marion and I strongly see where God has opened doors for us, to help us attain this goal of joining the Peace Corps and serving others. Now it’s showtime. Time for us to be His hands and heart in Botswana. We are eager to do it, with His help. Thank you for sharing this story. I am so happy that things have come around this way for you both and I am grateful that I will be able to join you in this journey. Hi Mobleys! I just wanted to say thanks for all of the great information you have posted on your blog. I found it while googling “placement interview” which I have this afternoon. I really enjoy reading your blog. Good luck with your Peace Corps adventure! I will be commencing mine sometime in May/June. You humble me with your story. I am your sister and I didn’t truly know your heart. I want to know everything about your trip, your adventure, your giving and your needs. I so admire you for your fortitude and direction. I think it is a Howard thing to know what you want and to work to get there. I agree, God is in control. I will be praying for you as you go and live vicariously through you and your work.